Having a hard time finding the perfect gift for your trackday rider? 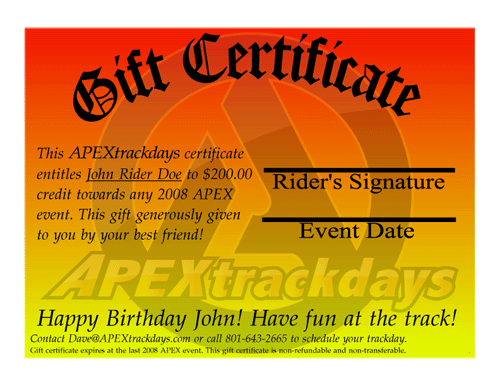 APEX is now offering personalized Trackday Gift Certificates starting at just $50! After buying the gift certificate, you will receive an email asking you to provide the rider's name and who you would like listed as the certificate provider. Once received, you will receive a high quality 8x10 PDF of the certificate via email within 5 working days. If you must have it sooner, please just let us know and you will be accommodated.